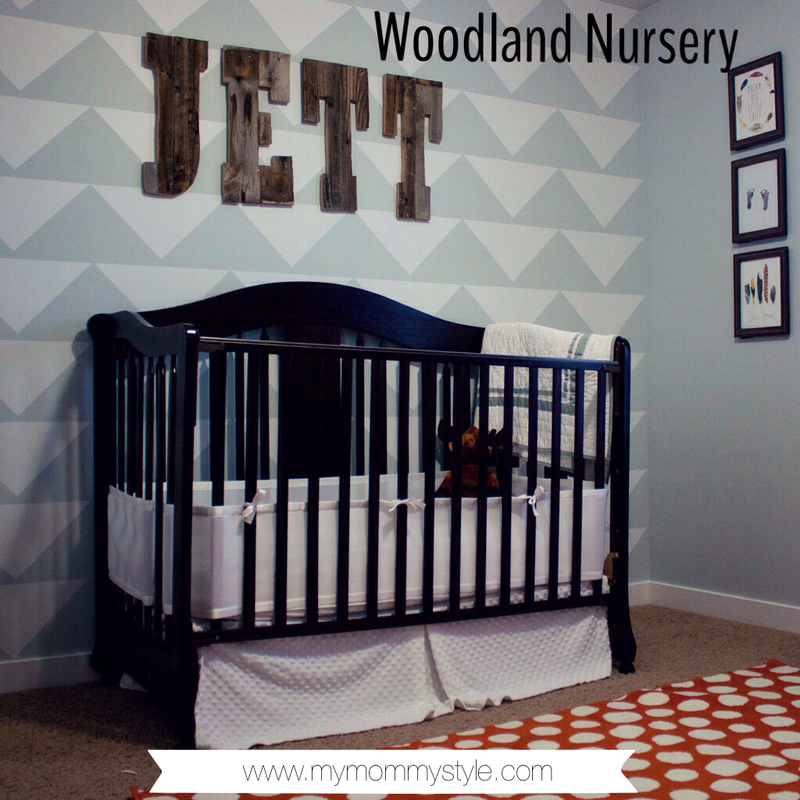 Things have been a little busy around here and I am finally ready to do our nursery reveal! 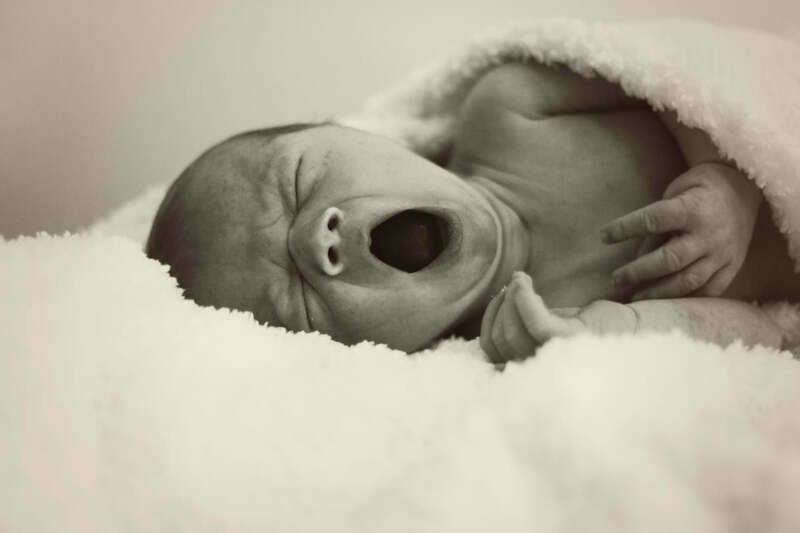 I can’t believe our little Jett is three weeks old, it has gone by so quickly despite the long nights! It is amazing how you can be so busy and not get a whole heck of a lot done. 🙂 I am doing the most important things done…lots of snuggles with this little guy. When I was trying to decide how to style the nursery I was debating between an adventurer theme vs. a woodland theme. It came together piece by piece as we finished our vinyl wall décor, (you can find the tutorial here), and then I found these prints from www.yellowbungalowshop.com and fell in love! They were the perfect mix of woodland and adventurer and kind of steered me in that direction. I love the prints made by Yellow Bungalow Shop because they are hand painted and then converted into digital prints. They are all unique and beautiful, exactly the element that I wanted to add to the nursery. I had the idea of asking a nurse at the hospital to make a print of Jett’s feet onto a simple white piece of paper that I could frame later to put in the nursery. They have the special way of doing the ink so that it doesn’t get on the baby and saves you a huge mess of trying to do it yourself later. 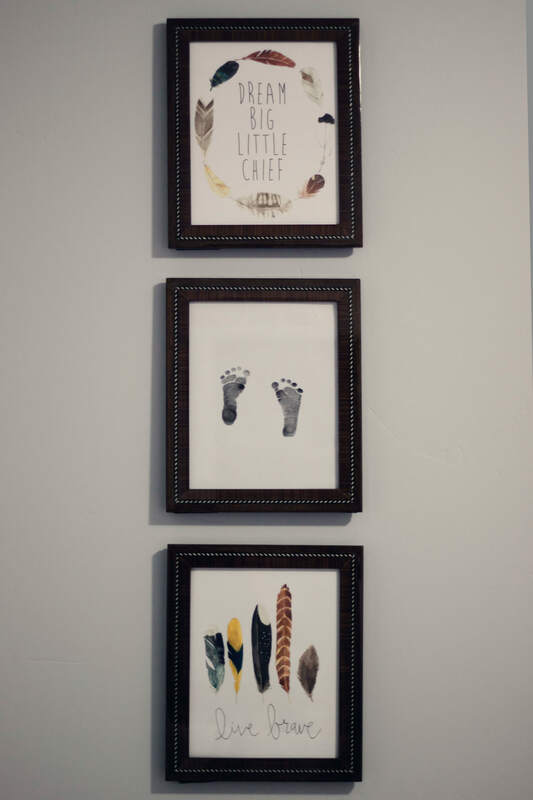 Eventually I will add pictures of Jett to the nursery but I love the personal touch his newborn feet add to the nursery right away…easy décor that is priceless. These pictures were taken just three days after Jett was born! A huge thank you to Lexi, my sweet friend and photographer, for capturing these precious moments. I will share even more about our first days and pictures soon. You can become a fan of Lexi’s photography here. I had these letters for Jett’s name custom made from old barn wood. I love the mix of nature it brings in with the modern wall. I had these wood letters made from https://www.onecutedecoration.blogspot.com/ and her prices are very affordable. You can contact her through her website or through her facebook page HERE. I was introduced to her through a “super Saturday” project and had the idea to ask her to make custom letters. She hadn’t done anything quite like it before but we both loved how it turned out and she is now offering them through her store! Originally I had planned on putting a map on the wall…but when I found this picture at the DI I fell in love. My husband thought I was crazy for buying it. This picture is totally something you could find on your grandma’s wall and doesn’t seem like it should be any where near a nursery; and that is exactly why I had to have it. It brought a really peaceful feel to the room and I like that it is unexpected. If you like this look, chances are you could snag a pretty cool one at your local goodwill too. This huge picture was $20 and worth every penny. And guess what? Hubby likes it now. And…because Angie at Yellow Bungalow Shop is amazing we have teamed up to offer you a chance to win a print from her store for you and a friend! Head over to our instagram account to enter to win! She is also offering a discount code to our readers for 20% off simply enter mms20 at checkout!